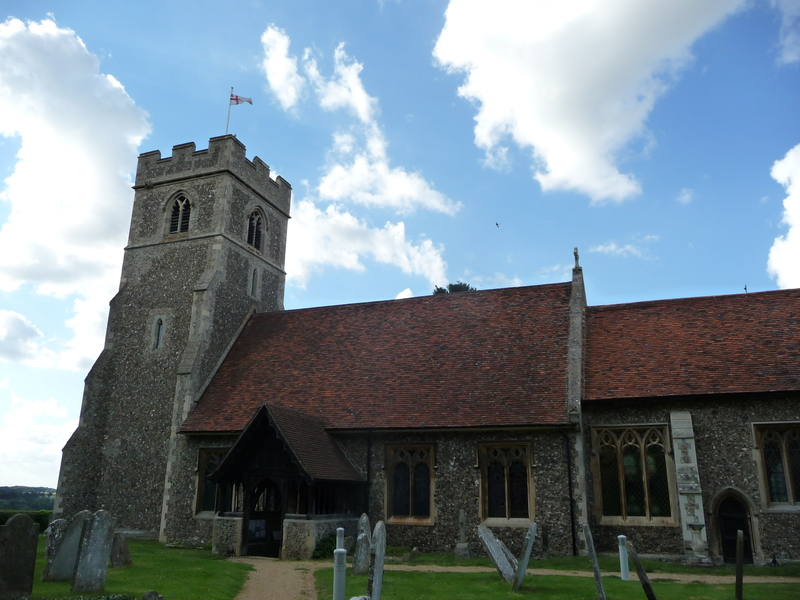 Doing some research on local churches and bells, I found some information on St. Mary’s in Prittlewell, which stated that all of their bells were renewed in the summer of 2010. Having moved to within earshot of these bells in April 2010 I would have heard them shortly after moving in to our new house, but now the bells I hear are the new ones. Looking at where the old bells had gone it was interesting to note that they had travelled far and wide…but with one bell remaining in Essex. I decided to see if I could record this bell in its new location, but no replies had been made to my electronic communications. So, when I was in the area, I thought I’d go and have a look at the church, to see if I could meet anyone and find out more about it. Imagine my surprise then when I arrived in Willingale and heard the sound of church bells ringing in the distance. They were in full peal (possibly not the correct term), and following the sound I quickly found the church(es) and quickly set up my kit in the yard. I could not determine which was the ‘treble’, or even knew if that bell had been installed, but was happy to have heard them nevertheless. I particularly like the more sustained sounds they make from after 6 minutes until the end. I was about to go into the church after packing down, as the door was open, but no sooner had I approached the door then the congregation burst into song. After my previous attempts to record inside a church (an organ practice in Thaxted) I decided not to interrupt them, and to go on my way. The person mowing their lawn with a ride-on lawnmower who was busy when I arrived, was still at work. Thank you for the information! If you ever want to add another recording of the bells, please do! To learn see more abut the restoration that used the Prittlewell bell visit the Willingale village web site – http://willingalevillage.uk/bell-ringers/the-bells-of-st-christophers/ and see video here (scroll down to the link) http://willingalevillage.uk/bell-ringers/. A good recording but not the best quality of ringing! Reading about the bells on St Christopher’s website (http://willingalechurches.co.uk/the-bells/), it seems that, though the bell was ringing as the treble at St Mary’s, once in St Christopher’s it actually acts as their second. So at the start of the recording, when the six bells are ringing in order from highest to lowest, it is the second bell you can hear. At the end, they are ringing down the bells – leaving them in a safe position until the next time they want to ring them.